You might hear Tairāwhiti Gisborne referred to as 'the chardonnay capital of New Zealand’' and the region wears this nickname with pride. But other red wine and white wine varieties also do very well in the Tairāwhiti Gisborne wine region. Viognier, pinot gris, merlot, cabernet sauvignon and the slightly-unpronounceable gewurtztraminer wines from Tairāwhiti Gisborne are known for their attitude and intensity. There are around 20 wineries in the region and several of them welcome visitors for casual tastings of their boutique wine range. The local visitor centre can fix you up with a Gisborne wineries map. If you're interested in Tairāwhiti Gisborne winery restaurants, Bushmere Estate (The Vines Gisborne) and Wrights Winery serve highly-rated cuisine, so you can match local wines to exceptional food. 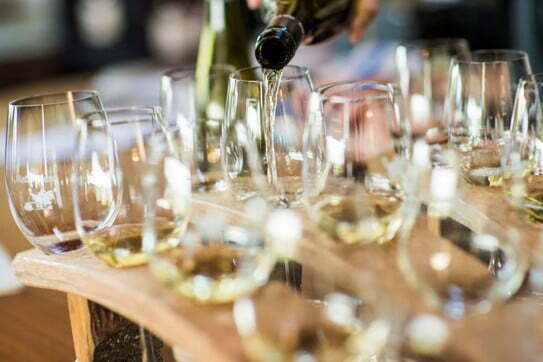 If you want to indulge without driving, searching on 'Gisborne wine tours' or 'wine tours Gisborne nz' to find locals who’ll show you around your pick of wineries in Tairāwhiti Gisborne. If you don’t have time to personally explore the wineries, visit the Wine Centre Gisborne at the harbour's edge in the city. You can enjoy a guided tasting experience that covers the best of Tairāwhiti Gisborne's wine types, and then tuck into a delicious meal at the on-site Crawford Road Kitchen restaurant. After you've eaten, take a stroll down Tolaga Bay Wharf - 660 metres of sightseeing happiness. From the wharf you can watch surfers working the beach break. If beer’s one of your favourite flavours, you're going to love Gisborne’s Sunshine Brewery. For nearly three decades, the Sunshine crew have been turning out a range of superb craft beers. With names like Double Happy, Young Nick's, Czar Bomb, Pipeline and Powercut, the brews made by Sunshine are truly inspired. They also do a heritage range, if your tastes are more conservative. You can sample a few at The Taproom, down at Waikanae Beach near the river mouth. There's an excellent snack menu to ensure you’re not sipping on an empty stomach. Where the Waimata and Taruheru Rivers meet you’ll find a concentration of good places to eat in Tairāwhiti Gisborne. On the eastern side of the marina there are favourites like The Wharf Café, Soho and The Works. On the western side is USSCO, The Rivers and a selection of cafes. And between the two areas is the Marina Restaurant, which gets consistent five-star reviews from diners. Tairāwhiti Gisborne cafes and restaurants are known for their inspired use of fantastic local ingredients. When you've had your fill of the best restaurants in Tairāwhiti Gisborne, drive north to the historic Tolaga Bay Inn where you'll find Uawa Café. This is a respected eatery for local specialties like fish and chips, mussel fritters and seafood chowder. After you've eaten, take a stroll down Tolaga Bay Wharf - 660 metres of sightseeing happiness. From the wharf you can dangle a fishing line or watch surfers working the beach break. Gisborne vineyard image courtesy of Strike Photography. ; Gisborne sunrise image courtesy of gisbornenz.com. ; Eastwoodhill Arboretum image courtesy of Brennan Thomas.